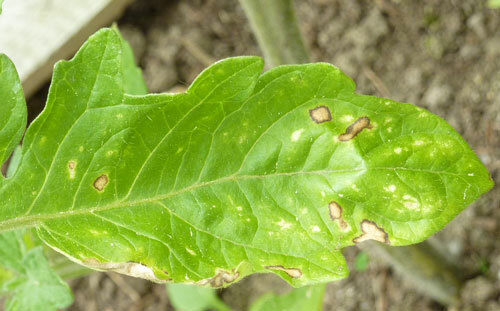 Septoria leaf spot (also called Septoria blight) is a very common foliar tomato disease that also infects eggplant and pepper plants. 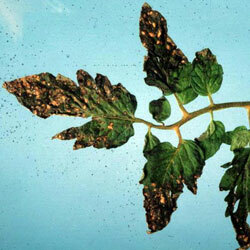 It and early blight comprise the two most common foliar tomato diseases. Caused by the fungus Septoria lycopersici, it can be very destructive. The disease begins when fungal spores are spread from other plants, workers, equipment, contaminated seed, or insects. Plants are most open for infection when temperatures are moderate and moisture is abundant. Leaf spot symptoms are first seen on lower leaves especially after the first fruit sets. 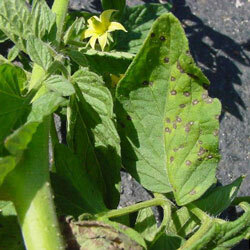 Spots may also appear on stems but rarely on fruit. A small yellow border is visible around each spot. Spots can merge until the leaf shrivels. Severe cases can cause the leaves to turn yellow, brown, then wither. The disease is worsened by moderate temperatures (20˚C to 25˚C/68˚F to 77˚F) and abundant rainfall. The fungus survives between seasons on infected plant debris. Extended periods of leaf wetness, high humidity, and warm temperatures exacerbate the development and spread of the disease. Plant only disease-free seeds and transplants. Prune lowest branches to prevent soil contact. Avoid over-watering and overhead irrigation. Promote leaf drying by watering early in the day. Two to four inches of mulch (such as dry grass clippings) placed on the soil around the plants will inhibit release of fungal spores. Use fungicide in combination with as many preventative methods as possible to be most effective.